Bamboo is quickly renewed resource. As one of the Earth's fastest growing plants, it does not need to be replanted and grows without pesticides and fertilizers. Bamboo is not wood, but it is as hard as wood while being as lightweight as the grass it is. It can be used much like wood for flooring, cutting boards, paneling and cooking and eating utensils. Bamboo utensils are simple to care for. Wash your bamboo utensils after each use with hot, soapy water. Do not soak them in water and do not put them in a dishwasher. Try and keep food from drying on the utensils by cleaning them right away. If food does get stuck on, gently scrape it away with a metal scraper, butter knife or your fingernail. A gentle scrub pad can also be used. Sanitize your bamboo utensils if they come into contact with raw meat, poultry or seafood. A bleach and water solution of one tbsp. of chlorine bleach in one quart of water will work, as will three tbsp. of white vinegar per one cup of water. Dry your bamboo utensils after cleaning with a clean, dry towel, rather than letting them air dry. Apply oil to your utensils fairly often, particularly after sanitizing, using a clean, dry cloth. Use food grade mineral oil to keep your utensils well-conditioned. 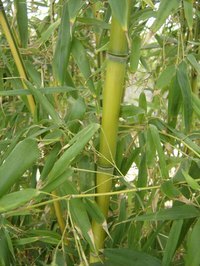 Without oil, bamboo can splinter or crack with repeated use and washings. Mineral oil is tasteless and odorless. Store your utensils in a dry place away from extreme temperatures that can cause cracking and splitting.